The Murdoch press has suddenly become most concerned about the future of the Labour Party, the Sunday Times today carrying tales of 1980s-style entryism and a totally erroneous suggestion that the upcoming leadership election may be suspended. The problem for Rupe’s supposedly upmarket troops is that their favoured party - the Tories - is the one with the real entryist problem. So what’s their claim? “Hard left plot to infiltrate Labour race … Harman urged to halt leadership vote” claims the headline, going on to tell “HARRIET HARMAN has been urged to suspend the Labour leadership race after evidence emerged that hard left [again] infiltration is fuelling a huge surge in party membeship … More than 140,000 new activists are projected to have joined by the deadline for registration to vote, a rise of more than two-thirds since the election, with many signing up to back the hard left [again] candidate Jeremy Corbyn”. Readers have the names of the Communist Party and the Green Party pitched to them, before being told “Some of the new members have previously stood as candidates for the Trade Union and Socialist Coalition, an electoral alliance including the Socialist Workers’ party, founded by Bob Crow, the late hard left [again] leader of the RMT rail union”. D’you think the ST wants us to think that there is something “hard left” going on here? 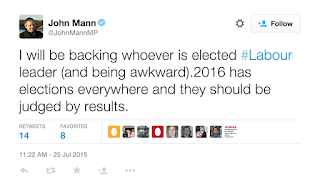 There’s certainly precious little journalism: readers are told “Labour MPs say their local parties have been flooded with new members, most of them supporting Corbyn”, but have only one name given, that of Bassetlaw MP John Mann, and even then, the Murdoch faithful have to be highly selective when presenting his contribution. While Mann has indeed said “People who chose not to vote #Labour at the General Election should not be able to vote for the next Labour leader”, he has also Tweeted “I will be backing whoever is elected #Labour leader (and being awkward). 2016 has elections everywhere and they should be judged by results”. 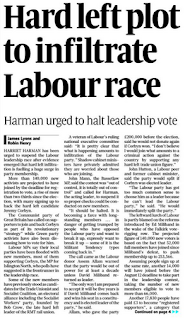 That second comment does not make the ST story, because it does not fit the idea of Labour being split. Meanwhile, the ST - like all the other right-leaning parts of the Fourth Estate - says nothing about the infiltration of the Tory Party by the alphabet soup of deeply conservative and often Neo-Con influenced lobby groups: the ASI, CPS, IEA, TPA, the Freedom Association (which has been banned from the secure area of party conferences for years), and of course the Young Britons’ Foundation, that supplies so many party activists. No, all that is hunky dory, but what is not is the prospect of yet another Labour leadership candidate that is beyond the bidding of Creepy Uncle Rupe: Corbyn, like Andy Burnham, has refused to give the Sun an interview. No wonder the Murdoch press wants to frighten the readers against him, to the extent of borrowing the “hard left” meme so beloved of hosts on Fox News Channel (fair and balanced my arse). 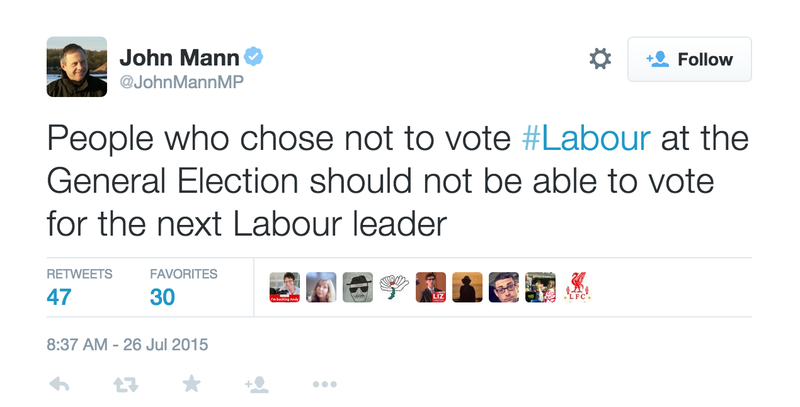 The Labour leadership contest isn’t being suspended. And Rupe still doesn’t have a vote. Do you ever think of buying it now? How very democratic, especially at the first whiff of someone who's mildly different. Jeremy should step up the pressure if only to turn fascist Rupe's boxies brown and double the OzYank stench. It might drive out hard right New Labour too, which would be a real service to the country. I bet the prospect of a Corbyn victory has got them working hysterical overtime at the Britain Desk in Langley and the Labour Desk at Vauxhall Cross. Bring it on, I say, bring it on. Anything that makes ranting righties squirm has my vote.